Note: Sh*t, I’m F*cked is a series by The Hustle where we ask entrepreneurs about a moment when they felt on the brink of failure. 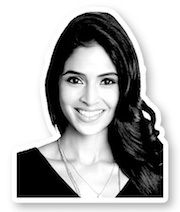 This week’s edition is with Payal Kadakia, founder and exec chairman of ClassPass, a fitness subscription service valued at more than $500m. Subscribe to The Hustle to get next week’s straight to your inbox. She grew up in New Jersey, the daughter of two chemists who immigrated from India, and devoted her early years to cheerleading and dancing. At MIT, she was always the person “doing crazy stuff.” When she wasn’t studying economics and operations research, she was planning dance shows, starting a club, or taking the lead on some ambitious, zany project. After school, she landed high-paying gigs at Bain & Company and Warner Music Group. Then, in 2009, she decided to strike off on her own and start her own dance company, Sa Dance Company. But Payal found success in dancing: Sa was soon performing sold-out shows and gracing the front pages of the New York Times’ Arts section. Not long into the venture, her father reversed his stance and began recommending graduate programs in the arts. One afternoon in 2010, while researching ballet classes, Payal got frustrated with how terrible the existing systems for finding and booking classes online were. So, she set out to create her own platform. “The idea was that these studios would get new business, but nobody was signing up,” she says. Users just wanted to keep going back to the classes they liked most and were creating fake emails to hack the site’s attendance limitations. And then, she was attacked. A week before her demo day pitch, Payal was sitting in a Starbucks working on a presentation. Out of nowhere, a man ran in, sprayed mace in her face, and tried to steal her computer and phone. Classtivity was eventually rebranded as ClassPass, and after tweaking the business model toward a gym-like membership that allows users to attend an array of classes, the company has gone on to raise $173m and see great success. Payal’s personal net worth is now estimated to be at least $50m. As many tech founders will tell you though, sometimes the biggest hardships come after you’ve “made it” — that unenviable period of time where everyone has written you off as a success story, impregnable to emotionally challenging situations. One of Payal’s toughest decisions has been “stepping down” as CEO of the company she founded and handing off the reins to one of her investors, Fritz Lanman, this past Spring. In her journey as an entrepreneur, Payal has become something of a figurehead for aspiring female founders. As a woman and a minority in an industry that is overwhelmingly white and male, she’s overcome the odds — and while swapping roles with Lanman was the right decision (today, she’s executive chairman of ClassPass), grappling with what other people might think has been an overwhelming source of concern her for at times.